What is Derailleur Cage Length? Cage length and why do we care? Derailleur cage length is related to derailleur capacity Usually you will see short cages on road bike derailleurs, because they use smaller rear cogs on their cassettes than those found on mountain bikes or hybrid bicycles. The cage carries the two guide pulleys between two plates, the inner and the outer plates. The top pulley is the jockey wheel and the bottom one is the idler. Perhaps you have noticed the chain making a backward 'S' as it wraps around the pulleys. You may find an 11/21 or 11/23 cassette on a road bike or even 12/25 or 12/28. Mountain bike cassettes can be 11/32, 11/34, 11/36 and now even and 11/46 or larger. 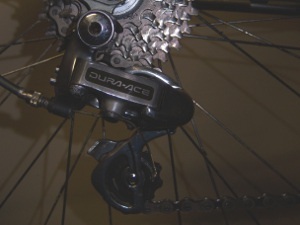 The long cage derailleur must handle a wider range of cogs and have a larger capacity. If you decide to use a larger cog on your cassette, you will need to find out the largest cog (sprocket) that your rear derailleur will handle. 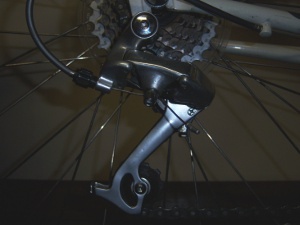 Small cage derailleurs have the guide wheel nearest the cassette mounted closer than the guide or "jockey" wheel on a long cage derailleur. This difference allows the guide to tack the cog more closely, allowing more responsive shifting. Contact me with tips and routines for bicycle fitness training or maintenance.